Minerals are truly a marvel. Defined as a class of naturally occurring substances (typically inorganic) with a crystalline chemical structure, their composition, growth habits, and color vary greatly. They are so important to the Earth’s formation and the evolution of life on Earth. Not only can they help us understand the Earth’s history, but they can also help us model exoplanetary structures (shout out to June!). Minerals help the human body develop healthily. They make strong bones, transmit nerve impulses, make hormones, help keep a normal heartbeat, and so much more. They are used in jewelry and have historically been mined for their beauty and their industrial use. Their physical and chemical properties are employed in industrial uses including paints and coatings, papermaking, rubber, adhesives and sealants, plastics, pharmaceuticals, agricultural pesticides, ceramics and glass, and numerous commercial mineral products. You can find them almost anywhere you look. From pots and pans to makeup to fruit juice to baby powder to cakes and bread, minerals are truly indispensable from life on Earth. Different people appreciate minerals for various reasons, such as their appearance, their physical and chemical properties, or even their ~healing powers~ (ha!). In this blog, we hope that you are able to see what minerals mean to us and can begin to understand what they mean to you. Today I got to sit down with Professor Bruce Marsh to talk about the history of the Earth & Planetary Sciences Department, the Williams Mineral Collection, and how the fields of mineralogy and petrology have evolved over the course of his career. 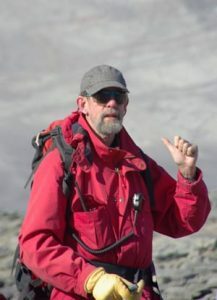 Marsh, Professor Emeritus and Hopkins Academy Professor, has been working in the Johns Hopkins’ Earth & Planetary Sciences Department for 45 years, lecturing and researching magma, volcanoes, and volcanic systems all around the world. Though he retired around 3 years ago, he has continued working and researching under the department. He is also currently writing a few books, including one co-authored with his two brothers about their childhood adventures in their northern Michigan hometown on Lake Superior. He has mentored over 32 PhD students, who have gone on to do important work all over the world. He explained that in the late 1870s, Johns Hopkins hired George Hunting Williams as an inorganic chemist and research associate in the field of petrology. Williams, who Marsh described as “prolific”, started the Hopkins Department of Geology, which would later be renamed as the Department of Earth & Planetary Sciences. Williams wrote books, spoke German, and was a firm believer in gender equality. In fact, he mentored the first ever female PhD recipient in the US, Florence Bascon. Nicknamed “The Stone Lady”, she would later go on to found the Geology Department at Bryn Mawr College. At the time of Williams’ career Johns Hopkins was the only institution that granted PhDs in the United States. Williams collected a huge amount of rock and mineral samples from all over the world. These would go on to form the Williams Collection here at Olin Hall. He also collected the first thin section in North America and implemented the first North American thin section laboratory here at Hopkins. Unfortunately, he contracted typhoid fever on a field trip to the Potomac and died in 1890. 50 years ago, some professors got together to rename the department and decided on the Department of Earth and Planetary Sciences. They believed that it captured the spirit of the department’s interests, ranging from Earth’s inner core to the outer parts of the universe. The name is now used at departments all over the US. Marsh commented that mineralogy and petrology have always been the gravity force of this department. Despite its small size, the department has been famous for both employing famous professors and producing incredible students. It has been a bastion for free thinkers. 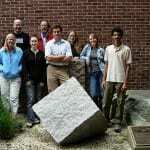 He believes that earth and planetary sciences attract those who are interested in the broader aspects of nature. The department has always been interested in quantifying and synthesizing geology, a field which has historically been more observational. He said that the department also aims to give students a firm grounding in every aspect of the natural world. At this point in his career Marsh is most interested in thinking about what legacy he wants to leave in the Department of Earth & Planetary Sciences and in his field of study. After moving from Latrobe Hall to Olin Hall in 1982, many samples, photographs, and papers have gotten lost in the shuffle. How, as an institution, can we preserve the work of our forefathers? “I’m in my Darwinian mode of research. I’m doing the important rather than the urgent,” Marsh said. In addition to his books, Marsh is also working on compiling a chronological history of the study of petrology starting in the late 1800s and extending to modern day. Through making introductions to these authors and their papers (which sometimes are longer than the papers themselves), he hopes to show future generations of scientists that these scholars were ordinary people who worked hard to produce something extraordinary. He believes that science is not the result of people who are born geniuses, but of investigators who are relentlessly curious. Coming soon…an interview with Professor Jenna Frye!